Felting needles are barbed needles that can be used to interlock wool fibers. As the needle is moved up and down, the barbs catch the scales of the wool and entangle them, creating felt. 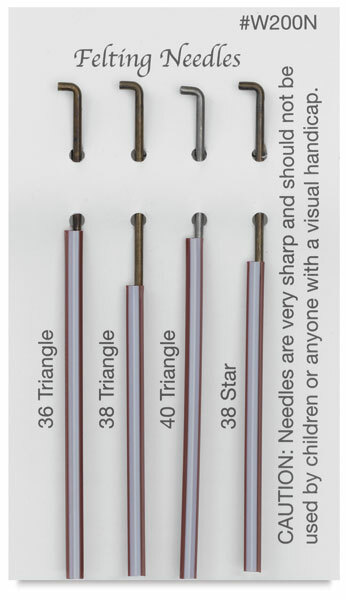 This pack of four felting needles includes one star needle and three triangle needles. The 38-gauge star needle is four-sided and leaves a smaller hole in the felted surface. It felts more slowly than the large-gauge triangle needle, producing finer detail. 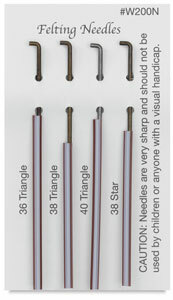 The triangle needles have three sides and are available in extra fine (40-gauge), medium coarse (38-gauge), and coarse (36-gauge) sizes. The 36-gauge needle is used for faster, coarse felting and leaves a larger hole in the felted surface. The 38-gauge needle is a general-purpose needle used for medium felting that leaves a smaller hole than the 36-gauge needle. It’s ideal for attaching felt to felt, or felt to wool. The 40-gauge needle is excellent for fine detailing, for sculpting, and for smoothing the surface.